When you think of storage, you probably think of driving the items that you want to store to a certain location and leaving them there. Later, if you want to move those items, you have to go back and get them and either move them yourself or hire movers to do so. Portable storage combines the best of both of these worlds. Most portable storage companies will bring the storage unit to you. The unit can be placed in your driveway or yard where you can fill it at your own pace over several days. If you live in an apartment, you may need to get a permit from the city in order to have the unit placed on the street for the duration of the needed time. Once you have filled your unit, the company returns to pick it up and keeps the storage unit on their premises for as long as needed. This is where the “portable” part of portable storage may come in handy. The company can also move your storage unit to another city or state as needed. In some cases, it will deliver your unit to another address while in others, you might need to go to the storage facility in the new city to retrieve your belongings. Portable storage can be a great option if you are moving but are not going to be immediately settled in your new home on arrival. Similarly, if you are planning on traveling for a time and then going to a new city, this can be a handy way to combine temporary storage and moving. 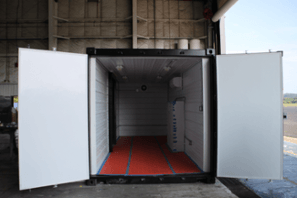 The number of companies in the portable self-storage business has grown in the last few years, and you can get a quote online based on your needs. When you are using a portable storage company, it is important to keep your contact information up to date and establish a reliable method of payment. Like traditional storage units, portable storage companies may have the right to sell your belongings if they are not paid on time and they are unable to contact anyone. However, as long as your contact and payment information remains up to date, you should not have a problem. Many companies allow you to set up an automatic debit, and if this is the case, you simply need to check your account regularly to be sure the money has been paid. Self-storage is a convenient and cost-effective solution for keeping your belongings safe during life’s many transitions.